Create a luminous pathway using several carved pumpkins, one of the main symbols of this day; impossible to imagine a fun Halloween without cool pumpkins. Any carved pumpkin always looks amazing and not only during the day, but also could illuminate your garden or house at night. Ideally you will put them on two sides of your pathway and even some of the first steps of your entrance. You could also put some sticks holding illuminated skulls. Obviously, the first thing that your guests will notice and you should never neglect decorating your entrance. Made with paper, install some large grave stones here and there in the front garden to recreate an old cemetery. Add some fresh earth to symbolise new tombs and let a plastic leg protruding out of the ground. Do not forget to add an epitaph on the stones and be creative! Hang chimes in trees and bushes for a mysterious sound environment. Place some small scary animals in specific places, a rolled up snake on staircase, a rat on the door handle and a curtain made of spiders. Play some music with diabolic cries, laughters and terrifying organs. Add a gloomy light by replacing your ordinary light bulb with red or green bulbs and candles. On a small table, lay out candlestick with lit candles. And of course, add some spiders! Hang false cobweb on the walls and ceilings, ideally the cloth must touch your guests when they walk past. Stick some phosphorescent eyes on the walls as well. If you have a fireplace, then you have to decorate the mantel piece. It can be a fantastic display. 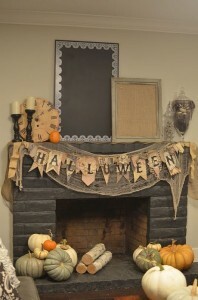 Add carved pumpkins of course, creepy spiders, bats. Place a hollow pumpkin on a table with plastic insects and small tea lights. Hang on the walls a large number of mirrors where you can stick scary eyes and insects. Hang bats, scarecrows, crows, skulls and other creatures on the ceiling. Every good haunted house is home to a few skilled spiders. 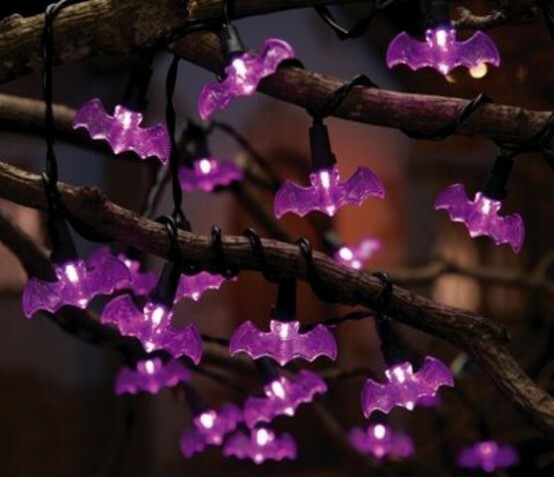 Go cobweb crazy by stretching out cotton balls over lamps, windows, doors, bushes and trees! Or if you’re looking for a little more detail, try using yarn, string, or crepe paper to create giant spider webs across your windows and throughout your garden in between trees, wooden posts, etc. Create curtains between each different themes with dustbin bags and cut some fringes into them. Hang skeletons on the windows. Scatter here and there large jars filled with fresh blood (water coloured in red)or water with torn limbs. In the kitchen, prepare a candle lit feast, a large bowl of green frost mixed with small plastic spiders, a head ‘roasted’ (stuffed mask), bleeding hands in plates and soup bowls with eyes. Just let your imagination flourish! 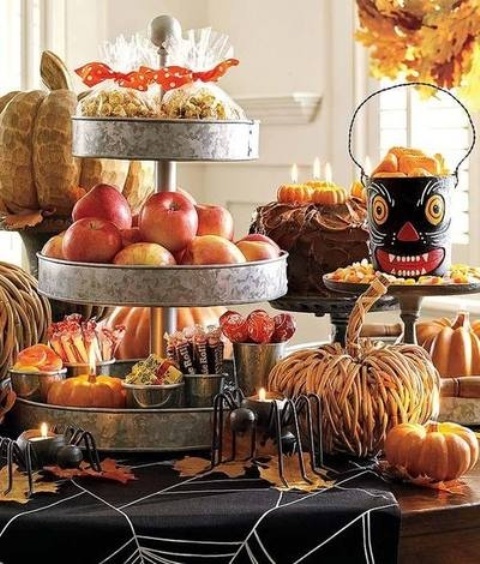 Use black tablecloths and create a cool centrepiece with red, black and orange as main colours for this feast. In one room, comfortably install a skeleton in the bed with a book on its knees. You could also offer some company and sit a mummy next to it. 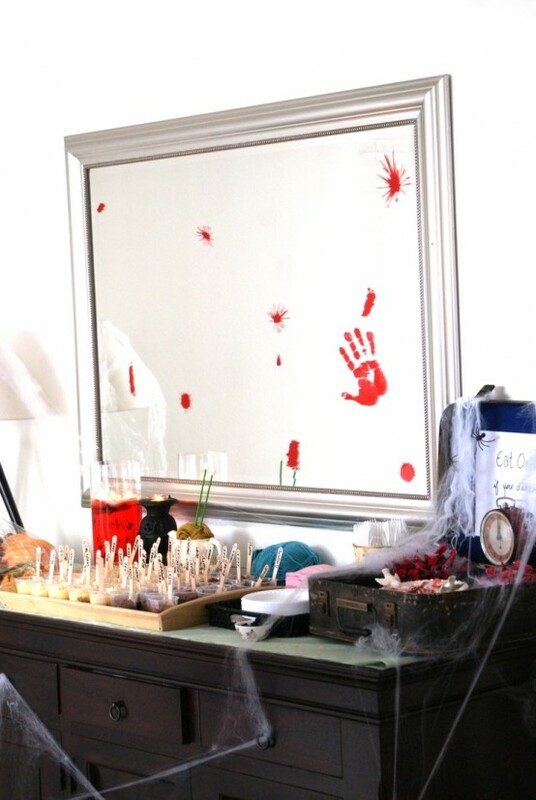 With large sticks and old sheets, create ghosts that you can place around your home. Using big cardboard boxes, create coffins where you can have some dolls lying in them. If you keep flowers around the house, don’t buy fresh ones for this occasion. Collect all your dead or dying flowers and put them out on display. They will look especially good if you put them on a table next to some ghostly pictures. Print out some scary pictures or drawings from the internet and put them inside picture frames that you already have. 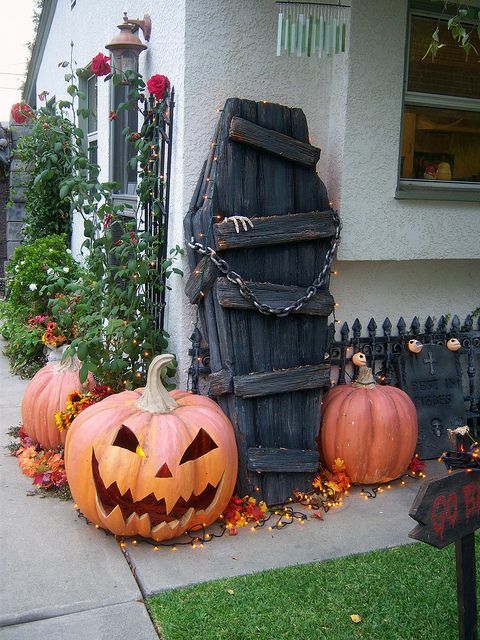 Place your new ghoulish pictures around the house and on the porch next to your dead flowers, add a few tea candles. To finish, true characters will create a particular atmosphere in your haunted home; enlist your family and ask neighbours and friends. Have fun. We wish you much pleasure in your haunted home. Happy Halloween! This article was posted in General and tagged halloween, haunted. Bookmark the permalink. Follow comments with the RSS feed for this post.Post a Comment or leave a trackback: Trackback URL.